MS Excel to MySQL Database Converter Software easily handles the process of conversion data between the leading database engines like MS Excel and MySQL. Database converter tool converts bulk database records or individual table records from MS Excel to MySQL database records. Advanced database migration tool performs accurate and convenient data transfer from MS Excel to MySQL. Db conversion program migrates bulk database records and selected columns records from MS Excel to MySQL. Professional database converter program helps you to save your valuable time by converting bulk database. 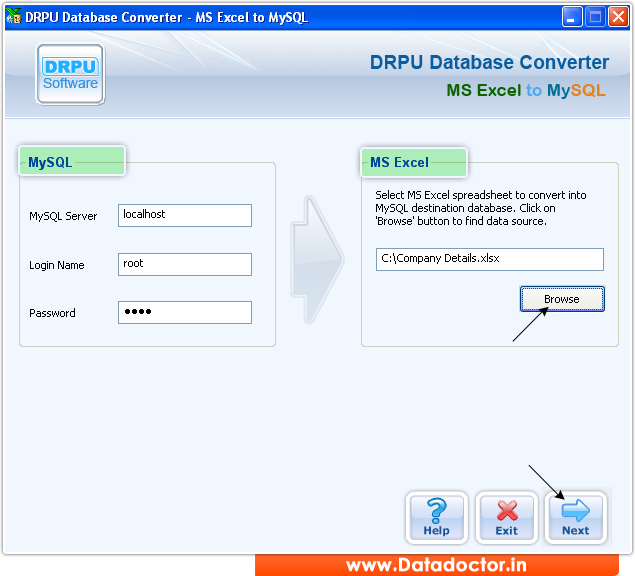 MS Excel to MySQL database converter software easily converts indexes, primary key and other database attributes. » Batch Excel converter software converts single or a large numbers of XLS to XLSX files and XLSX to XLS files. » Excel converter program empowers you to select multiple files simultaneously or browse entire folder along with subfolders. » Excel migration program provides option to save not converted or same extension files. » Converter software can work without installation of Microsoft Office in your PC. » Excel conversion software is developed with easy-to-use interface, so that novice user can handle this program.